Description: Style, quality & value and absolutely beautiful! Be first to see this gorgeous almost new home! Chefs kitchen w/ granite, stainless appliances, gas, island w/ seating & lots of beautiful cabinetry! 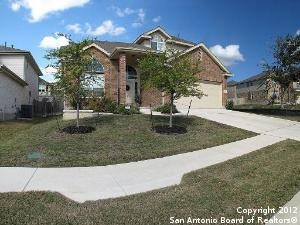 Downstairs master retreat w/ step ceiling, walk in shower, garden tub & his & her sinks! Pretty fireplace w/ gas starter! Lots of decorative archs & shelf ledge! No vinyl & tons of upgrades! 3 big bedrooms, bath & loft up! Great pantry! Covered patio! Water softener! Spinkler system! Cul-de-sac! Great hoa pool!